The first hotel on this site was called the Wellington Hotel and was erected in 1882 for Michael McMahon, who had previously been the manager at the Devonshire Arms. The Wellington was a two-storey building with a verandah across the front. Its location was deliberate to attract custom from travellers using the railway station. 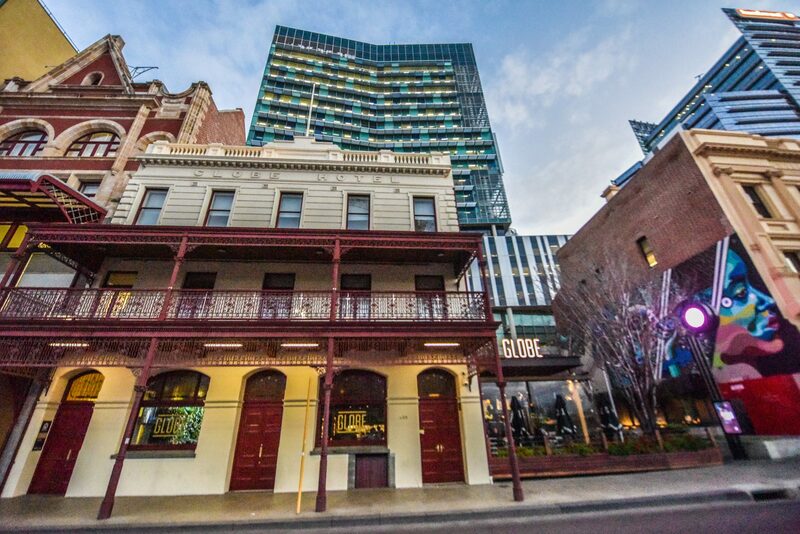 By 1891, the Wellington Hotel had been renamed the Globe Hotel and in 1910 Patrick Connolly, the new manager, had the old building demolished and the new three-storey Globe Hotel erected to designs by significant Perth architect, JJ Talbot Hobbs. An early photograph shows a two-storey verandah with canvas awnings that could be pulled down to enclose the verandah area. In the latter half of the 20th century the Globe Hotel began to provide cheap accommodation for single men. In the mid-1990s, renovations took place and the hotel was converted for use as backpackers’ accommodation. As part of the Wellington and William Street redevelopment, the Globe Hotel was again modified, this time into a three-area gastropub. It continues to offer refreshment, both to travellers and the workers from the nearby government offices. A hotel, known as the Wellington Hotel, was originally constructed on this site in 1882 for publican Michael McMahon. He had previously been the manager at the Devonshire Arms. The Wellington was a two-storey building with a verandah across the front. Its location was deliberate to attract custom from travellers using the railway station. By 1891, the Wellington Hotel had been renamed the Globe Hotel and in 1910 Patrick Connolly, the new manager, had the old building demolished and a new three-storey Globe Hotel erected to designs by significant Perth architect, JJ Talbot Hobbs. An early photograph shows a two-storey verandah with canvas awnings that could be pulled down to enclose the verandah area. A 1932 advertisement for the hotel shows the ‘spacious’ saloon bar, which was ‘well lighted and ventilated and equipped with modern refrigeration’. The other photograph is of the first-floor lounge and drawing room which opened onto the balcony verandah. In this, the still extant timber folding doors that separate the two rooms are shown folded back. Called ‘de Pedro’s Globe Hotel’, accommodation was available for up to 34 guests and it was stated that ‘country visitors specially were catered for’ on the first and second floors.